Had England won the World Cup in 1970, then in our view it would have eclipsed what was achieved four years earlier. Not only did they not have home advantage this time, but they were contending with the severe heat and altitude of Mexico; their preparations were dealt a major blow when Bobby Moore was arrested shortly before the tournament when he was infamously accused of stealing a bracelet; they were unpopular visitors to Mexico and were kept awake prior to playing Brazil by rowdy fans outside their hotel; they faced the added pressure of being defending champions, with plenty of critics believing their success in 1966 was mainly down to home advantage and key refereeing decisions rather than their abilities; had they got to the final this time they would have needed to beat a great Brazil side, rated better than the West Germans of 1966; and for the quarter-final against West Germany, England were without star goalkeeper Gordon Banks, who had fallen ill (sparking conspiracy theories about him being deliberately targeted). In the four years since 1966, England had continued to pick up results that proved they remained tough to beat – losing just four times. But any perception that the nation basked in continual glory with being world champions would be wrong, as the side did not always win plaudits for their displays and Sir Alf Ramsey’s wingless approach was not to everyone’s taste. A third place finish in Euro ’68 was hardly a catastrophic failure but it was not what England sought and a reminder that there was plenty of work to do if they were to retain their status as world champions. Qualifying automatically as holders at least gave them plenty of time to get ready for a World Cup in such a different climate to their own, with England visiting Mexico in the summer of 1969 as part of their end-of-season tour. The squad also topped the charts with Back Home shortly before the finals. “We’ll give all we’ve got to give for the folks back home,” they vowed. England’s players (and friend) appearing in Ecuador ahead of the finals. Ramsey had four years to prepare for a World Cup in Mexico, but only five months to plan for facing their opponents. The draw in January 1970 wasn’t kind to the holders, as solid European sides Czechoslovakia and Romania were placed in their group. The Czechs had been runners-up in 1962, while Romania – or ‘Rumania’ as they were generally known at the time – twice drew with England in friendlies during 1968-69. But the real talking point concerned the presence in the group of Brazil, as the 1966 winners were paired with the champions of 1958 and 1962. “A stir like an electric current ran through the thronged company at the Hotel Maria Isabel in Mexico City,” wrote Geoffrey Green in The Times about the sides being paired together. England would be expected to get through, but the presence of Brazil meant winning the group and remaining in Guadalajara for the next round was going to be a difficult ask. But as Bobby Charlton said: “There will be some frowns in Brazil too.” Ramsey would hail it as an “excellent draw”, though it is questionable if it is the group he would have really wanted. One thing he certainly did not want was the infamous incident during England’s warm-up tour of South America, concerning the sensational accusation that Moore had stolen a bracelet from a shop near the lobby of the hotel where they were staying in Bogotá. He was arrested and the English nation reacted furiously to the suggestion that their beloved captain could ever commit such a crime. Most firmly believed Moore’s innoncence, not least Ramsey who described the allegations as “too ridiculous for words”. The clock was ticking towards the start of the tournament and England were left to fly out to Mexico without Moore. It was a major blow for the side’s preparations, but that was nothing compared to the ordeal Moore was going through. Moore maintained his innocence as the matter became front page news and a diplomatic incident. He was finally given the good news on May 28 that there was insufficient evidence for a prosecution and he was free to go to Mexico. Whatever anger existed over the arrest in the first place, there was now relief that he was a free man and he could lead the side in the World Cup. It is testament to the man that he could perform so well after such an ordeal. Two of England’s matches at Mexico ‘70 remain embedded in our minds. And the other two are barely mentioned, even though England won. On June 2 the waiting finally ended as England took on Romania. Millions back home were staying up for the 11pm kick-off (4pm in Mexico). Over the course of four years, the side had changed from the 1966 final but retained some familiarity. Moore, Gordon Banks, Alan Ball, Bobby Charlton, Geoff Hurst and Martin Peters were in the side against Romania, while Jack Charlton and Nobby Stiles were in the squad but no longer members of the lead cast. Meanwhile, George Cohen, Roger Hunt and Ray Wilson were all no longer on the scene. In the previous four years several players had come to the fore, with Terry Cooper, Brian Labone, Francis Lee, Alan Mullery and Keith Newton picked against the Romanians. It was a strong line-up, one that was widely rated as better than that of four years earlier. Geoff Hurst is congratulated after scoring for England against Romania. England have been used over the years to not being the darlings of the host nation at major tournaments, but in 1970 they contended with a particularly noticeable level of antipathy from the Mexican public. Their status as world champions drew them increased attention, while it wasn’t just in Argentina that Ramsey was unpopular for his infamous “animals” comment in 1966. The decision to import food and water on health grounds would upset the Mexicans, to the extent that the authorities ordered that the products could not be brought in and had to be destroyed as the players were left living off fish fingers. A reluctance by Ramsey to deal with the local media did not help matters either. If the display of discipline was pleasing, the outcome was delightful as Hurst picked up where he left off in 1966 by scoring the only goal on 65 minutes. One significant difference from four years earlier was that substitutions could be made, something that would be welcomed in the intense heat. The injured Newton was replaced by Tommy Wright, with Peter Osgood coming on for Lee. England were off to a winning start as attention turned to the next contest – the gala battle against Brazil. The events of June 7, 1970, have become the stuff of legend. England met Brazil in the noon heat of Guadalajara, having endured a sleepless night as fans chanted outside the hotel. It was yet another challenge thrown England’s way, but the players were ready for a clash that would be a wonderful spectacle as Brazilian flair met English desire and discipline. Ramsey told his players beforehand: “Do you like gold boys? Because the ball is a lump of gold today. Don’t give it away.” Both the heat and quality of opposition meant this was a game where England could not afford to be chasing the Brazilians. It was a game of iconic images that would be celebrated forever: the unforgettable save by Banks to deny Pele; the legendary tackle Moore made to halt a goalbound Jairzinho; the delightful play of the Brazilians, epitomised by the goal they scored through Jairzinho; and the mutual respect evident as Moore and Pele swapped shirts at the end. “See you in the final,” seemed a fair conclusion after such a competitive match. 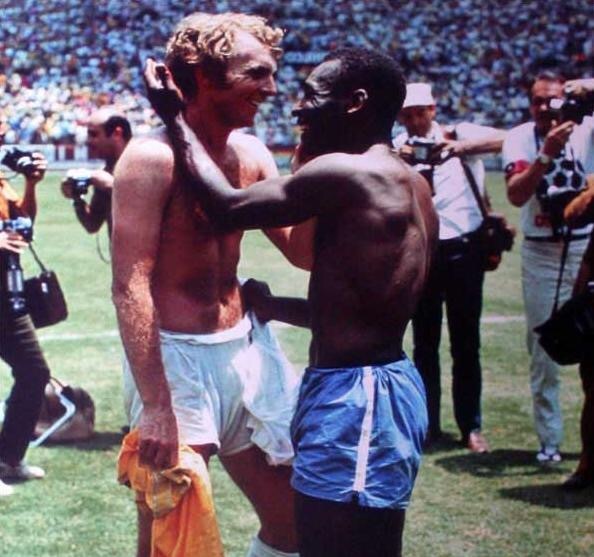 The mutual respect between Bobby Moore and Pele is clear after England’s loss to Brazil. Rarely has an England defeat been so fondly recalled by the nation in later years, but this had been a match to savour and they had proved they could compete with the Brazilians in scoreline if perhaps not technical ability. They missed chances to level matters, most memorably through sub Jeff Astle who squandered a glorious opportunity. “You can’t win matches if you miss open goals,” declared BBC commentator David Coleman (this was a touch unfair as it wasn’t actually an open goal as the Brazilian goalkeeper Felix was in front of him). 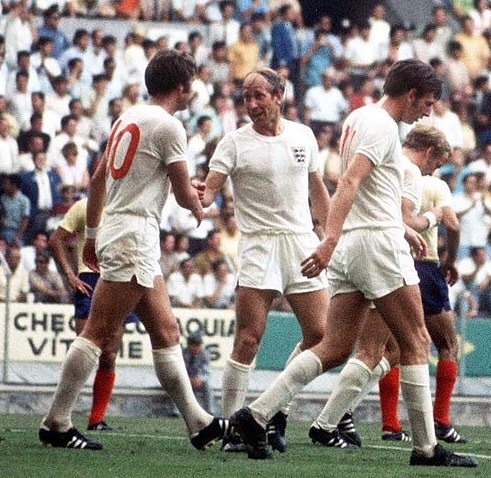 Despite the defeat to Brazil, England remained favourites to reach the quarter-finals ahead of Romania and Czechoslovakia and they knew a point against the Czechs three days later would ensure progression – with Brazil winning all their group games. 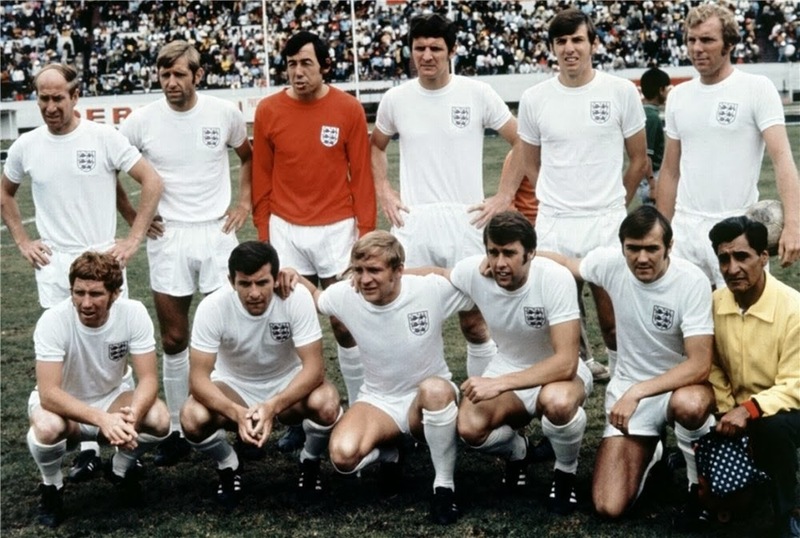 Ramsey made changes, with Astle and Jack Charlton brought into the side and Allan Clarke unusually making his England debut in a World Cup match. TV viewers would face a struggle deciphering between England’s light blue kit and the white of the Czechs, while those in the North-West of England would see even less as industrial action had forced Granada off the air – with this match exclusively live on ITV. 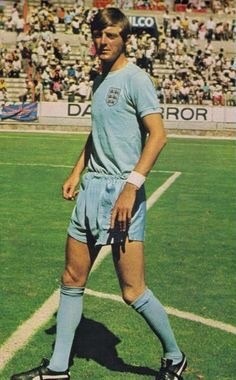 Allan Clarke during his day of multiple celebration as England beat Czechoslovakia. England’s failure to win the group meant they would have to make their way to Leon for the quarter-final clash with West Germany. They were refused permission to fly and it would prove an extremely uncomfortable coach journey for Banks, who was suffering from a stomach bug. At the time there appeared little cause for alarm, as several players had endured brief sickness upsets that had soon cleared. But with Banks it seemed Montezuma really was exacting revenge, as the goalkeeper was kept up most of the night and, whenever all now seemed well, he would again be in urgent need of a bathroom visit. Although he came through a fitness session – one which Banks found curiously light, as though Ramsey was desperate to pick him – the illness would not go away and it became clear he would not be able to play. Peter Bonetti was in. 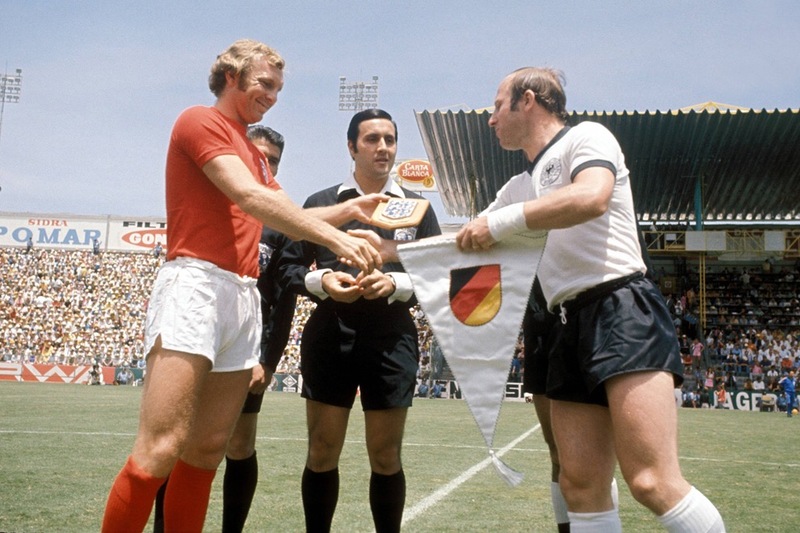 Captains Bobby Moore and Uwe Seeler exchange pennants before England faced West Germany. It was a repeat of the 1966 final, even the colours worn being the same with England in red and their opponents in white. The West Germans had gained a modicum of revenge for 1966 by beating England for the first time in a friendly in 1968, but it looked here as though England would deliver again when it most mattered. Mullery broke the deadlock with his only international goal on 32 minutes, with Peters doubling the lead five minutes after the break. Both goals illustrated England’s ability to carve their opponents open and have players in the right position to finish. All was looking good. Then came the 69th minute. Franz Beckenbauer found space and fired a shot that surprisingly deceived Bonetti. The Germans now had a foothold in a game that had looked beyond them and it was a blow to Bonetti’s confidence, given he had conceded a goal he would ordinarily have saved. 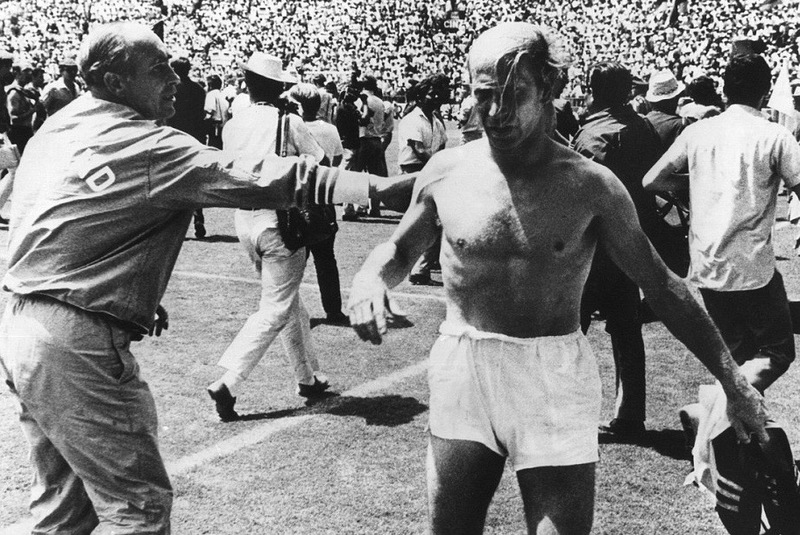 After it went in Bobby Charlton left the field, with Bell replacing him. Shortly afterwards, Hurst was inches away from clinching the victory after good work by. Bell. But the impetus was now with the Germans and, moments after England brought on another defender as Norman Hunter replaced Peters, the tie was levelled as Uwe Seeler headed over Bonetti to send the game into extra-time. England’s World Cup dream was ebbing away. Even if they could win this one, extra-time in the lunchtime Mexican heat would take much out of them for the next round. Four years earlier Ramsey had famously ordered his players to their feet ahead of extra-time to send out a strong psychological message to their tired opponents, but here several were unable to do likewise. When Hurst had a goal disallowed, it seemed as though everything that had gone right for England in 1966 was going against them now. And three minutes into the second period of extra-time the turnaround was complete. Gerd Müller had scored a staggering seven goals during the group stage and he showed his predatory instics to volley past Bonetti. There would be no reply and the champions were dethroned. Bobby Charlton was left watching on from the bench and he would never add to his 106 caps. A myth would grow that Ramsey made the substitutions at 2-0 with England looking home and dry. In reality the West Germans had already pulled a goal back and the tide had turned, while it was a similar stage of the game to when Charlton had been withdrawn against both Brazil and Czechoslovakia. Yet the perception that the substitutions had worked against England would never go away. But those who watched matters closely saw other things that gave cause for concern. Mirror man Jones felt that it was England’s retreating tactics that changed the game and undid their previous good work. He wrote: “They sat back on the edge of their penalty area, conceding the middle of the field and the area immediately in front of them. The Germans sensed hope, moved forward into the space they were offered and suddenly, out of nowhere, they were back in the game.” Beckenbauer certainly benefitted from both this and Bonetti’s error, with the goal breathing fresh life into a German side who had looked as good as out. “We had them dead,” said a bemused Ball as he tried to come to terms with the sudden turnaround. All four quarter-finals were played simultaneously and England’s collapse would come as a particular surprise to those who were not able to watch it live. BBC commentator Barry Davies, covering another of the fixtures, recalled during the 2006 series World Cup Stories hearing that England were 2-0 up. “I never gave it another thought. England didn’t lose from two up,” he said. It may sound like English complacency, but the statistics would back up that line of thinking. Ramsey managed England 113 times and the only other occasion they failed to win after going two goals ahead was a 2-2 draw against Scotland in 1965, when they were effectively left with nine players due to injuries. Seeing games out was an English forte under Ramsey. except when playing West Germany in World Cups. A particularly cruel experience awaited the groggy Banks, who stayed in his hotel room. In a less technologically enlightened world than today, he would have no idea what the score was and could not watch the match live on Mexican television – instead seeing a delayed showing. Banks saw England surge 2-0 ahead before his team-mates arrived back at the hotel. He believed the likes of Ball were winding him up when they said they were out and going home. Only when Banks caught sight of the anguish on Bobby Charlton’s face did he accept England really were out. And the feeling that Banks had been greatly missed would linger forever. Bobby Charlton exits international football and England exit the World Cup. Banks would not lay the blame at Bonetti’s door but speculated in his book about whether the Chelsea goalkeeper was psychologically prepared to appear in a game of such magnitude at short notice, given he was a distant number two and Ramsey seemed desperate for a half-fit Banks to play instead. Others have wondered if Alex Stepney would have been a better option, given he had proved himself on the big stage when Manchester United won the European Cup in 1968. But Bonetti had six caps compared to Stepney’s one and was established as deputy to Banks, while he had helped Chelsea win the FA Cup against Leeds United just weeks earlier. He had been doing fine in the game against West Germany until he conceded the soft first goal. But sadly for him he would forever be associated with England’s exit and he was never capped again. It is widely felt that England were better man-for-man in 1970 than 1966, but this does not mean they were universally considered a better unit. Bobby Charlton would say he did not believe the boys of ’70 were more talented as they failed to win it. It’s perhaps simplifying matters to judge the two sides on World Cup showings given one was at home and the other overseas, but England did at times seem more vulnerable in 1970 than they had looked during the tournament four years earlier. Their attack was also less potent in 1970, Hurst the only striker to net when he scored against Romania. Only those who were part of the squad can honestly say if there really was less togetherness than before and if it cost England. Certainty, had they seen out the game against West Germany then that line of thinking, the loss of Banks and the substitutions made by Ramsey would probably barely be mentioned. But the collapse in Leon would be forever dissected. It was a sad end to a tournament that had promised much for England but had not delivered the desired success. It certainly marked a turning point in the England-Germany rivalry, the West Germans going on to beat the English with far more conviction en route to winning the 1972 European Championship and following it up by lifting the World Cup on home soil in 1974. England weren’t even there, the 1970s becoming a decade of decline and disappointment that began out in the heat of Mexico.